An Egg Stinger in Tropical Jungle. Egg Stingers are combat automatons constructed by Dr. Ivo "Eggman" Robotnik, deployed by the mad scientist in and around Soleanna during Sonic the Hedgehog (2006). They are named only in the game's official strategy guide. 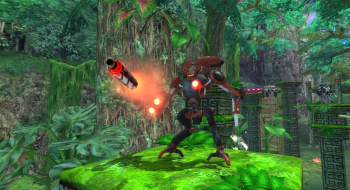 A variant of the more common Egg Gunner robot, painted red instead of white, the Egg Stinger model trades the Gunner's arm-mounted vulcan cannon for a second missile launcher. They have the ability to hover with jet-boosters installed in their legs, and have the same light armour as the Egg Gunners, destructible with a single spin attack.